Try to place your first town on a tile that is not adjacent to other terrain types. For example, place on a canyon that only boarders other canyons. In doing so your options for subsequent town placements will be increased as only drawing another canyon tile will force you to place your town next to the previous town. As a house rule we use the bridges printed on some hexes as adjacent sides. This helps to make river hexes not as much of a blockade in non harbor maps, on the other hand it helps certain scoring options with certain population groups (eg Miners). It also makes it possible that you can jump over other settlement zones (eg. going over villages build in cliff zones). Try using multiple terrain cards! Avoid more than two per player. But with each player having at least two cards in hand each turn makes settlement placing smoother, eliminating most analysis paralysis. We also limit using the special abilities to just two per turn. This drags the game out a little longer, and allows for more strategic placement. Not a huge deal breaker, but fun sometimes. We tried to use a “secret” victory points card. Don’t do it. It breaks the game, making points incredibly lopsided. 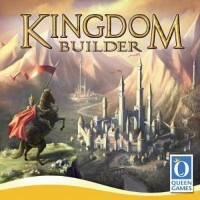 Kingdom Builder is mostly a tactical game… changing strategies as the cards dictate. However, there is one combination that works every time if you know that to do with it: Harbor + Paddock. Harbor allows you to place in water. Paddock allows you to jump two spaces. So, when these are available… STAY AWAY FROM WATER AS LONG AS YOU CAN. Why? You ask. Well, because once you get these two… and you will if you are smart…you will be able to bounce around the board with the Harbor as long as you are not adjacent to water. Once you get near a castle or another action tile you can jump away from the water to the tile using the Paddock. Get all the castles and tiles you can before focusing on the other missions. Kingdom Builder Strategic Tip ~ Harbor + Paddock = Strategic Gold! While I find Kingdom Builder to be on the lighter end, I would like to have a bit more control with the placing of my settlements. At the end of your turn, draw 2 cards : during your turn, choose 1 of these to play. You can play where you are forced to discard the second. Or, you may allow a player to decide whether to keep the extra, only drawing one the next turn. I think I prefer the forced discard, to keep some of the need to optimize how you play your 3 settlements within a region based one what is drawn. The subtle strategy of settlement placement shouldn’t be completely replaced, but limiting your chances of drawing four flower fields in your first turns is helpful! This is a very tactical game. I’ve seen many people get very upset because they focus on a long-term strategy while playing Kingdom Builder and finding that the cards, or the circumstances, defeat that strategy. This game is more about finding the best move at the moment, especially if that move helps set up better moves in the future. The strategy in this game is not based on anticipating what will happen, but instead on the idea that you can’t anticipate what will happen.